Many people knows xiaomi as a smartphone manufacturer, but aside the affordable smartphones, Xiaomi is also known for producing a whole lot of other smart and cool gadgets such as air purifier,1@ smart alarm system, cameras, speakers, automatic screwdriver and even smart toothbrush. Now, the company has once again added to it's long list of products and this time around, it's an automatic foldable umbrella. The umbrella which is said to be usable both in the rainy and sunny season is made of nylon to protect against rain and also another coat on the top to protect against utraviolent ray. The greatest selling of this new umbrella is actually it's automatic foldable feature. This means the umbrella can open and close automatically without doing it manually. 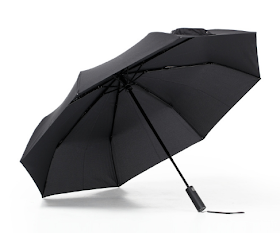 The umbrella is already available for purchase since the 24th of July and it goes for $15 which is less than N6,000.